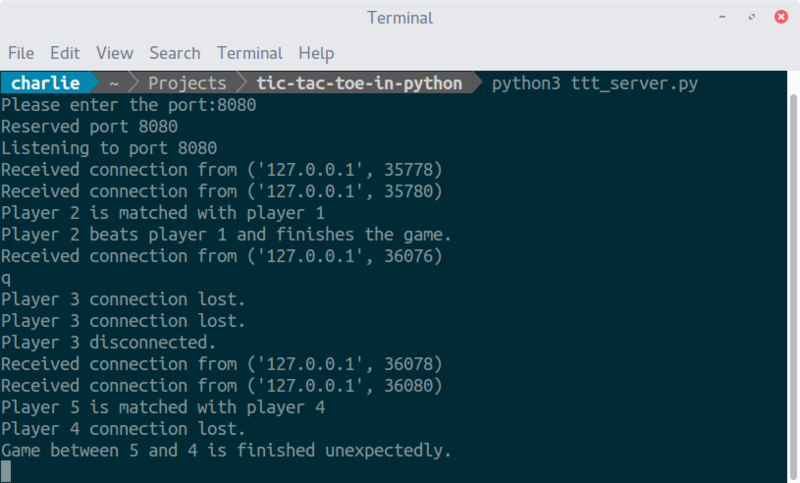 To set up the server for my Tic-Tac-Toe Online, you can run the following shell commands. After setting up the upstart configuration script, if you have installed upstart on your server machine, the server script will automatically run on system start up. And respawn will start it back up if it is killed or exits non-zero (like an uncaught exception), so the server script can always keep running on your server. Where the argument port_number is a 16-bit unsigned integer port number used for the TCP/IP protocol addressing. You can also run the server script with no arguments, and you will then be asked to enter the and port number. If the server fails to bind the port, you will see an error message as above. You can then choose to abort, change port number, or retry, as you wish. Usually this is due to port conflicts, or the port is reserved by the system. When the server is successfully started, you will see some messages as above. And then the server will be able to accept clients. You will be informed when clients are connected, when they get matched and start a game, when they disconnect, when some unexpected error happens, and when they finish their game, etc. Once the server gets started, it should be able to keep running without getting interrupted. Even when the clients’ connection fails, or some unexpected messages are received from the client, the server can handle those exceptions gracefully and inform you of the exceptions. 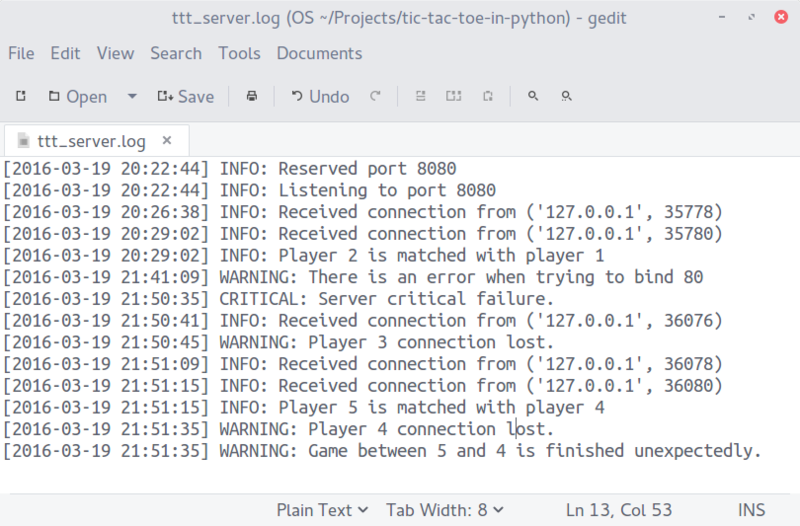 All the information, warnings, and exceptions, will also be logged into the file ttt_server.log. Now that you’ve set up the server. You can now go ahead and start the client program from Tic-Tac-Toe Client Manual.